Saturday mornings, when boy Trinidad awoke to win control of the TV from his siblings, he got hungry. One Saturday—after carefully observing his mother making breakfast all week—he fished a frying pan out of the cupboard, grabbed some eggs and cheese, pushed a chair up to the stove and got cooking. “What is this?” he heard his mother call from the doorway. But once they had settled down at the table with the eggs that he had scrambled, she was smiling. “From now on you can make breakfast for your brother and sister, and I can sleep in!” And that was how it started, in a little apartment in a then Dominican Lower East Side neighborhood not far from where, decades later, Trinidad and his business partners, Nicole Ponseca and Enzo Lim, opened their first restaurant, a modern Filipino place called Maharlika. “Back then, when I was growing up down here,” Trinidad remembers, “There were Dominican and Polish restaurants, a few diners. Indian row was the most exotic thing we had!” But back then people mostly ate in, especially Dominicans. So mostly Trinidad remembers his mother’s love-filled dishes. There was her signature lambi, a preparation of ground conch, olive oil, onions and cilantro; her snapper, cooked in coconut milk with coconut rice on the side; and the classic rice, beans and steak he has tried and failed a million times to recreate. Today, at Maharlika, Trinidad’s mother remains a kind of muse, despite the Filipino focus, supplying the restaurant with a spiced coconut-rum drink she still prepares by hand in the kitchen of Trinidad’s boyhood. The way from weekend egg-maker to New York City restauranteur was long and full of detours for Trinidad. There was a career in commercial photography, some cubicle time at dot-coms, a catering company and some odd years tending bar. Finally, at the magic age of thirty-three, Trinidad’s calling called, and off he went to culinary school. Some of his technique he picked up there, but the real test came at the first real gig he landed: line cook at Lola, a dinner-and-show type soul food joint in Soho. There Trinidad soon rose to executive chef. “I had no clue what I was doing!” he laughs. “So for the first few months I worked day and night, seven days a week, seven in the morning till midnight. I had to learn fast!” His now business partner, Ponseca, hired Trinidad into that job. His flexibility and facility for picking up new things made an impression. So when she began dreaming up Maharlika, she ultimately turned to him for a new take on a cuisine that was virtually unknown in the Manhattan restaurant scene. And Trinidad is just getting started. “I’m still new on the scene,” he admits. “I’m a baby compared to these guys that have been in the business for ten, twenty years.” But ask anyone which Dominican chef to watch in the city, and everyone agrees: Trinidad is talent. So check out Maharlika in Manhattan or at Brooklyn’s Dekalb Market. 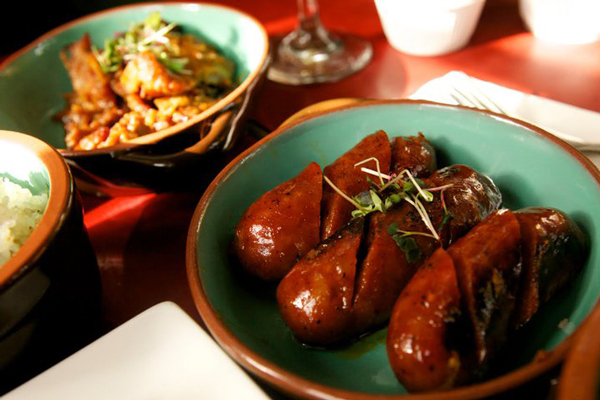 And stay tuned for Trinidad’s and Ponseca’s next venture, set to launch later this year in the East Village.